A Moscow day trip to the Russian Vatican, Sergiev Posad. Sergiev Posad is about 60k to the north east of the center of Moscow. The drive is about 2 hours. Allow about 6 or 7 hours door to door. The religious center of modern Russia. A must for all Russian tours. The monastery was established in the middle of the 14th century. Walls and churches of 15-17 centuries. 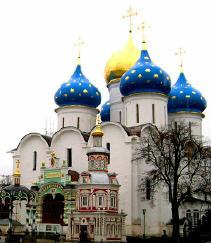 Sergiev Posad played an important role in Russian history. It is sometimes called "The Russian Vatican". Here, in Trinity Cathedral, is kept the famous Andrew Rublev's icon - "The Trinity", which was created specially for this cathedral. Includes transport, guide, entry to the museums in the Trinity Monastery.